Made of soft curly maple with an amber stain. 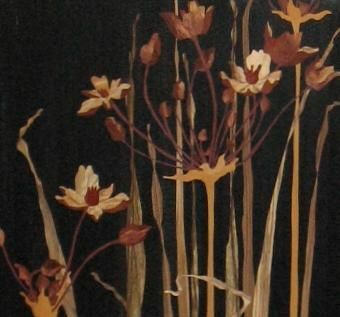 The marquetry panels in the doors depict flowering rush. Each pictorial has well over 100 pieces of veneer including cypress, bubinga, figured maple, figured ash, mahogany, padauk, laurel, walnut and several unidentified woods. Sand shading of the veneers was added for dimension. The carcass is dovetailed by hand as are the drawers. These drawers have curved fronts which are made from cores of bricked solid quartered wood for stability, then covered in shop-made thick veneer of the same curly maple as the case. 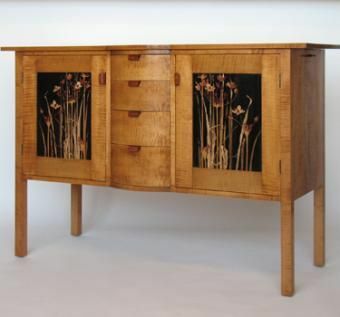 Handles are made from bubinga which relate to the bubinga found in the marquetry panel. 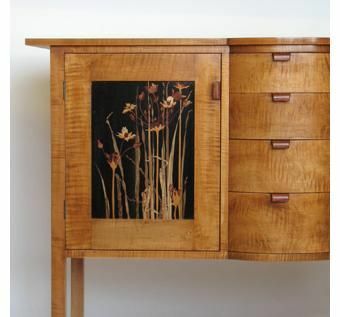 The effect of the very delicate whimsical grass and flower images framed by seemingly rougher and irregularly figured maple is meant to evoke a country vernacular. However the form also is reminiscent of Art Deco.